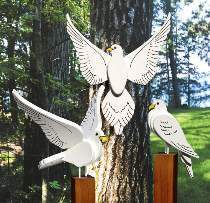 White doves symbolize peace. They are often used at weddings to celebrate the purity of love. It is said that a dove brought an olive branch to Noah to signify that land was near. The sitting and flying doves measure 13” and 14” long. The center dove measures 19”H. Plan includes FULL SIZE patterns for all three projects. Order eyes for all birds and fiberglass dowels for legs for the sitting and flying doves, separately below.